The limit is looking a little further away for CBS’ Limitless. According to Deadline, the network has ordered a full season pickup for their new drama. The news doesn’t come as a total surprise. 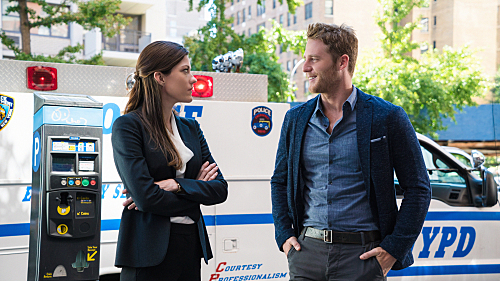 Alongside NBC’s Blindspot and ABC’s Quantico, Limitless is one of the stronger new series on the air. Since its premiere on September 22, the drama, which is based on the 2011 feature film starring Bradley Cooper, has seen consistently high ratings. CBS has also ordered six backup scripts for its new medical drama Code Black. What do you think? Do you watch Limitless or Code Black? Are you excited to see more? LIMITLESS IS ON EOF THE BEST MODERN CONCEPT TV SHOWS THAT IS REAL IN IT’S POSSIBILITIES OF MENTAL POTIENTIAL IN A STRICK SCIENCE AND MEDICAL CONCEPT,HAS A CST THAT BLENDS THE FORMULA TO A T AND IS ENJOYMENT FOR ALL AGES AND CULTURES; SO WHO ARE THE TRULY LIMITED DUMBASSES OF CBS ??! I love, love Limitless – so look forward to seeing it every week – a unique entertainment experience – plz bring it back ! Limitless, Qantico, Code Black are shows I look forward to every week. PLEASE keep these shows. By the way I am 50. I adore Limitless it beats many established American series easily. Please please do another series or two or three.. I love Limitless. I hope it makes it back. Great writers. Limitless is a great show. It is intellectually stimulating and worth watching. Limitless is my favorite show on tv. It has everything rolled into one show. Comedy,Drama, mystery and action. It always has a way of pulling you in making you want more every time. I would love to see it remain on air for many seasons to come. Hi, Just to let you know I really enjoy this program. It is different and it makes you think. Love the characters and the fact that there is no gore. I love this show. It’s different. I love the individualized characters and how they play off of each other. The show is mystery, keeps me guessing on where and when the next plot change is going to take place. It makes me smile. Please, please keep this show on the air. Thank you! I am glad there will be more episodes of limitless and code black. I really like the actors in both series andhope to see these 2 series for years to come. Do the series ads necessary to keep public interest up and all should be successful.